When I first happened upon Alisha Ramos' newsletter and online destination Girls' Night In earlier this year, I was like a moth to a flame. Coined as "a newsletter for women who'd rather stay in tonight," how could I not love it? That's my mantra. And it's apparently the mantra of over 20,000 other women, too, who have also subscribed to Girls' Night In's weekly bits of digital wisdom. 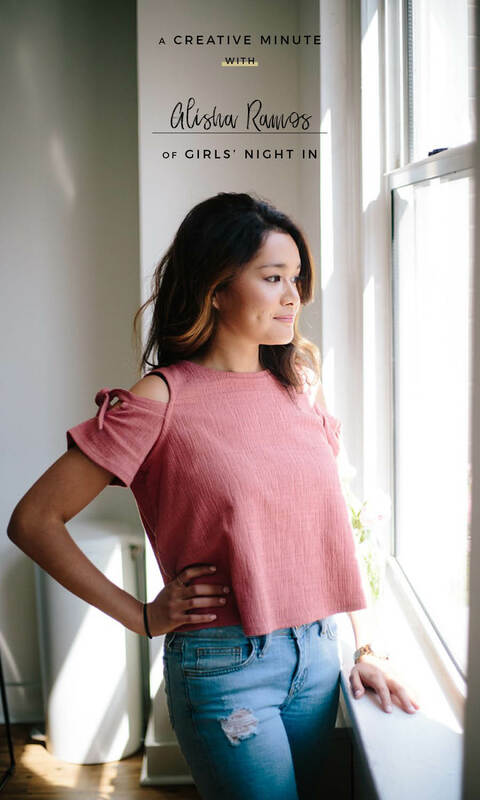 Learn more about Ramos' path to launching Girls' Night In, the invaluable lessons that she learned while working at a tech startup and how she carefully planned to turn her entrepreneurial dream in a reality – below! Q: Share a bit of your story with us: what was your experience like working at a tech startup, and what led you to founding Girls’ Night In? A: Before starting Girls' Night In, I worked as a designer and engineer in tech. I remember when I first started my tech career at Vox Media, the now-popular Vox.com had just launched. Watching that brand and audience grow from zero to literally millions was an amazing experience. Personally, I grew as a designer, engineer, and eventually a Design Director, but business-wise I was able to learn how one builds a brand that reaches millions of people and serves their needs. Girls' Night In isn't quite in the millions yet, but the lessons I learned at Vox inform how I approach building the business from a brand, strategic, and technology perspective. I always knew I wanted to create something of my own but I never had an idea I felt truly passionate about. After the presidential election, I noticed that a lot of my friends and other women around me were feeling incredibly anxious and stressed out and it was a dark period for a lot of people, regardless what political party you were affiliated with. The news cycle was relentless and overwhelming, and I wanted to create something that brought joy into people's lives. I wrote and sent off the first newsletter in late January of 2017 to test an idea I had around creating products centered on strengthening the friendship you have with your girlfriends. I wanted to see if there was a market out there that would generally relate to the ethos of a "girls' night in." Little did I know that the newsletter would become our core product! We're now over 20,000 subscribers that read our weekly newsletter and it's amazing. We get emails every week where someone says, "Opening your newsletter is my favorite part of the week, I've told all my girlfriends about it." Comments like that make it all worthwhile. Although our products are growing and evolving, our mission is still the same as it was when Girls' Night In launched: to help women relax, recharge, and cultivate community with one another. We now not only write the weekly newsletter, but we also host monthly book clubs in 7 cities internationally, recently launched a shop, and there's so much more coming soon to serve our audience of busy, smart, and engaged millennial women. "I wanted to see if there was a market out there that would generally relate to the ethos of a "girls' night in." Little did I know that the newsletter would become our core product!" Q: I always love to ask! What does your workday routine look like, and how do you try to maintain a balance between managing content for Girls’ Night In, engaging with your thriving community of women and fulfilling orders for the recently launched Girls’ Night In Shop? A: Good question! I'm lucky to have an amazing team of women (and a man!) who work with me part-time who help me with editorial, community, partnerships, PR, and technology. For the shop we actually have a warehouse and fulfillment service, so that's kind of well-oiled machine at this point. I personally of course still wear many different hats throughout the week and even days. I've recently subscribed to a form of "extreme scheduling." It's kind of crazy and I'm not sure if anyone else does this. Basically, the night before, I'll lay out 3-4 big things I want to accomplish tomorrow. I'll then literally schedule events in my calendar in 1- to 2-hour blocks where I focus exclusively on those things. Creating focus and prioritizing items has been huge for me this quarter and going into next year. When you're a founder it's so important to carve out time for yourself to go into a "deep work" mode, particularly for items that require a greater amount of concentration, like writing. I've found that the only way I can do this is by scheduling events in my calendar — otherwise, I'd get so distracted by emails, requests for calls, pings, articles, social media, that I'd never get anything done. I've also struggled with wanting to do too many things at once, so I've gotten better at figuring out what opportunities to not pursue and which tasks require a "done is better than perfect" mindset. Q: What did the planning process look like when you decided to leave your job in tech to launch Girls’ Night In? Did you have a carefully planned exit strategy, or did you take more of a leap of faith? A: I did plan it out a bit. Honestly, I was scared to leave my job. I really liked my job and absolutely loved my team and the mission of the company (my previous job was working for a public benefit corporation called Nava, working as a design lead on Healthcare.gov). I was scared to lose that financial stability. So I did plan things out financially for a bit. I put more into savings than I normally would have. I created a spreadsheet of how many months I could go with no income, and a plan for how to begin generating income. If you'd like to start your own business, I highly recommend taking a hard look at your finances. I grew up in a lower-income household, so taking that financial leap was and still is a huge risk for me. I really dislike the advice, "Just take the leap and do it," because it discounts the privilege that many entrepreneurs enjoy when they're first starting out, whether it's gaining an initial investment from their parents or family, or having the right connections to secure an initial round of financing. I think about privilege a lot. Usually, it fuels me to work twice as hard. My general advice would be: keep an eye on your finances, plan and plan some more, because once you run out of money, that's the end of the road. "If you'd like to start your own business, I highly recommend taking a hard look at your finances. I grew up in a lower-income household, so taking that financial leap was and still is a huge risk for me." Q: What does YOUR ideal night in look like, and how do you like to unwind and recharge after a busy workday? A: I really love to cook and (humblebrag) I think recently I've gotten better at it from practice, so it's become more of a meditative state for me. My favorite place to get recipes from is Bon Appetit for entrees, and Smitten Kitchen for a lot of her dessert recipes. I'm also a skincare enthusiast, so I do love a good sheet mask or purifying clay mask while watching something on TV. The most recent show I watched was The Marvelous Mrs. Maisel on Amazon — so, so good and empowering too. "Make sure whatever you create is fulfilling a need." Q: For fellow women who are seeking a creative outlet or want to launch their own online lifestyle destination, what would your greatest piece of advice be? A: Make sure whatever you create is fulfilling a need. Understand your audience and what they want. If you're unsure, talk to friends, strangers, send out a survey, anything that provides you with more data on what gaps your new endeavor can fill. Want more of Girls' Night in? Keep up with the cozy crew on their website, Facebook, Instagram @girlsnightinclub and @girlsnightinHQ on Twitter!